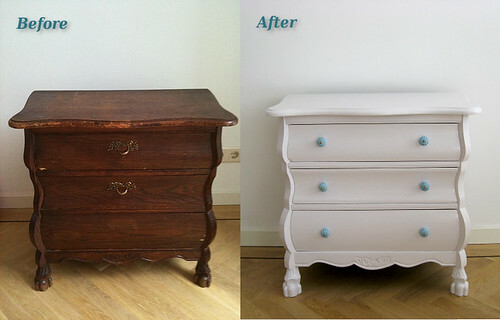 Awhile ago, my sweetie and I lugged home a beat up dresser from the thrift store. Ok, well, I just carried the drawers. It wasn't too pretty looking, with lots of chips, nail holes, and missing drawer pulls. But some patching of holes, some drilling of new ones, a bit of paint, some pretty knobs, and ta-da! 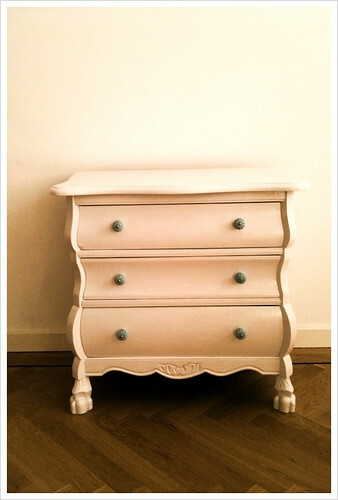 A pretty little dresser for my bedside. It's still in the dining area at the moment because the paint is still a bit odorous. I'm really pleased with how well it turned out, though. In other furniture news, we got sick of not having a desk or a coffee table or a proper dresser (this bedside one is quite small) and caved to the ease of IKEA. Last weekend, we rode our bikes out to IKEA (a rather fun adventure) and picked out some things. We paid to have them delivered and then biked home (not as fun an adventure since D had to awkwardly carry some items and there was a charming headwind). 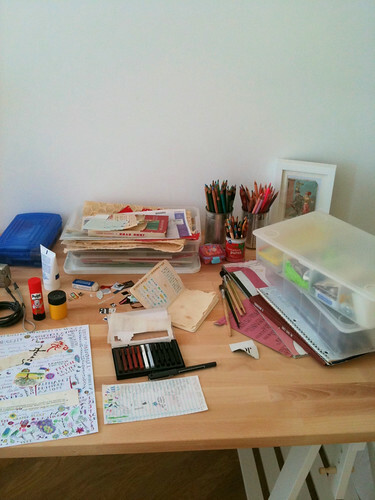 But it's oh-so-nice to have a real desk to be typing this at, and to have my current artsy mess scattered on it instead of the dining table! Loooooove the dresser! It looks fantastic. That dresser looks fantastic. How cute are those blue knobby drawer pulls!!! Wow. That is a yummy dresser. Great job! !